The past two years with USA Hockey's National Team Development Program have been a whirlwind for U.S. National Under-18 Team forward John Hayden. He wouldn’t trade the experience for the world. 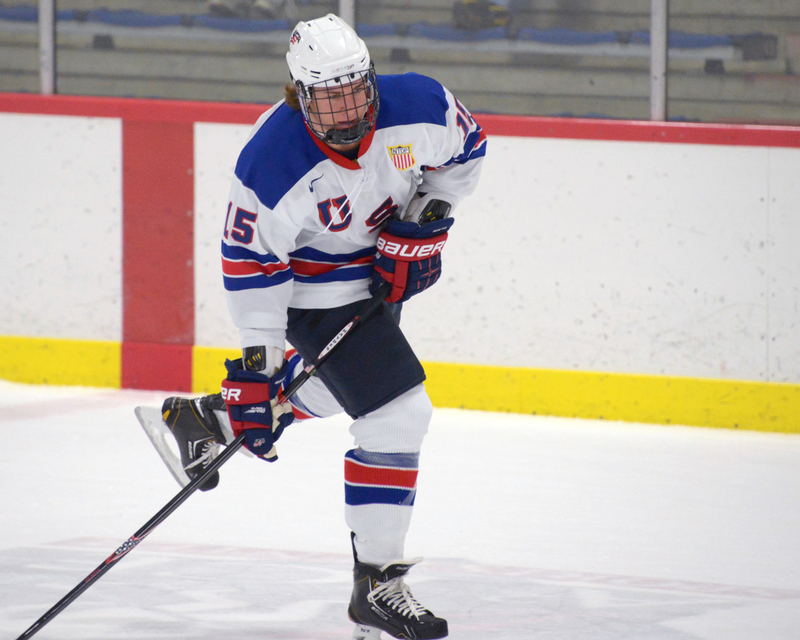 Hayden credits the NTDP and its various coaches with making him a better hockey player through actual hockey practices as well as off-ice training and video sessions. The Greenwich, Conn., native played on some of the biggest stages this past season, including the 2013 International Ice Hockey Federation World Under-18 Championship, the 2013 USHL/NHL Top Prospects Game and the 2012 Four Nations Tournament, which was held last November in Ann Arbor. “The Four Nations was my first week back from missing the first few months due to an injury,” explained Hayden, who tallied one goal and two points in the four-game tournament. “I really wanted to come out and help the team get the win. We ended up winning the tournament, and it was a great feeling. The 6-foot-2, 220-pound forward plans to have a busy summer between his training and the 2013 NHL Entry Draft, which takes place June 30 at the Prudential Center in Newark, N.J. Hayden is ranked 29th among North American skaters. “It would mean a lot to be drafted and an award for the hard work I have put in,” he said. “Early on in the season, I didn’t get as much attention with the injury, but it motivated me to come back and have strong year. It was tough early in the year, after I missed the All-American Prospects game, and it was hard to watch the team play NCAA games without me. Hayden is also quick to credit his parents, Mark and Diana, for being a “driving force” in helping him become a better player and person. A great example of his parents’ support would be the 2013 USHL/NHL Top Prospects Game on Jan. 23, when Hayden scored the lone goal for Team East and earned MVP honors in the 2-1 loss. “We played at Michigan State the night before the game,” Hayden said. “My mom came in for that game and then drove me from Michigan State [which is located in East Lansing] to Muskegon. It’s just another great example of her being there for me. Hayden plans to take his game to Yale University next year. It was an easy decision for Hayden to want to play for the Bulldogs, who captured the NCAA championship this past year. “It’s close to home; they have a great program,” he said. “I like the way they play the game and the way they are coached. I like the facilities, and as soon as I visited there, I knew I would be happy there.